It only took one quarter for Drew Brees to prove he’s ready for the regular season on Saturday night. And the rest of the New Orleans Saints‘ starting units didn’t look too shabby themselves in a 23-17 victory over the Indianapolis Colts. The Saints weren’t perfect — especially in the penalty department (10 for 84 yards), which has been a maddening problem this preseason. But they did most of the important things right while cruising to an early 20-7 lead. It’s a good thing New Orleans Saints tight end Jimmy Graham got his contract situation figured out, because the NFL just took a decent chunk of it away. Graham was fined $30,000 by the NFL for dunking the football over the goal post twice in last Friday’s preseason game, according to numerous sources including the New Orleans Advocate. The NFL actually took it easy on him. As the Advocate pointed out, he could have been fined a little more than $33,000 based on the league’s rules for unsportsmanlike conduct penalties. 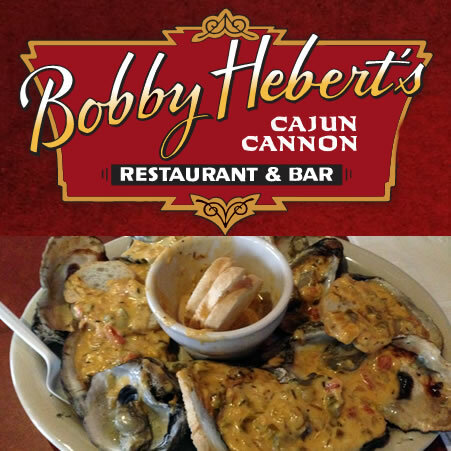 Just had lunch at Bobby Hebert’s Canju Cannon and it was very enjoyable. In fact one of my favorite dishes was the Fresh Louisiana Oysters on the half-shell, chargrilled over an open flame, smothered with our unique zesty garlic and herb cajun cream sauce, finished with a fresh blend of Parmesan and Romano cheeses. Cannot wait to see what the founder of the Who Dat Nation has next for me to enjoy ! Make sure you visit soon and support Bobby !! NEW ORLEANS — Although the New Orleans Saints beat the Tennessee Titans 31-24, coach Sean Payton will be seething over the stunning amount of penalties his team committed. The Saints finished with 22 of them (14 in the first half) and had at least four others declined. Payton was already upset when the Saints committed 10 penalties a week ago. No, Pierre Thomas has not become the odd man out in the Saints’ three-way time-share at running back. After sitting out the first preseason game, he was heavily involved Friday — especially as a pass-catcher and pass-protector on third downs. Thomas caught three passes for 27 yards. As I’ve been saying, I expected to see him in Darren Sproles‘ old role tonight. … The Saints’ run game wasn’t very effective Friday, but Mark Ingram did catch a 23-yard touchdown pass — showing that he’ll have a chance to play a more versatile role this year in the Saints’ offense. 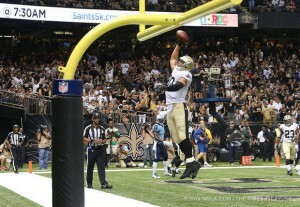 New Orleans Saints tight end Jimmy Graham has largely ignored the NFL’s efforts to stamp out his signature touchdown celebration. But after he dunked the football over the crossbar of the goal post for a second time Friday night, Graham may have fueled a conflict with his head coach. Posted in Saints News | Comments Off on Dunk Jimmy Dunk ?? 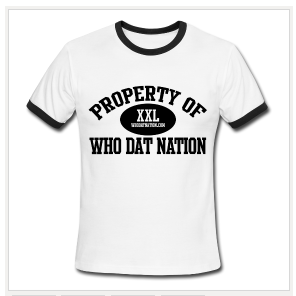 If you don’t remember where your Who Dat Nation shirt is… get another one !! Click here to see how to order yours now ! 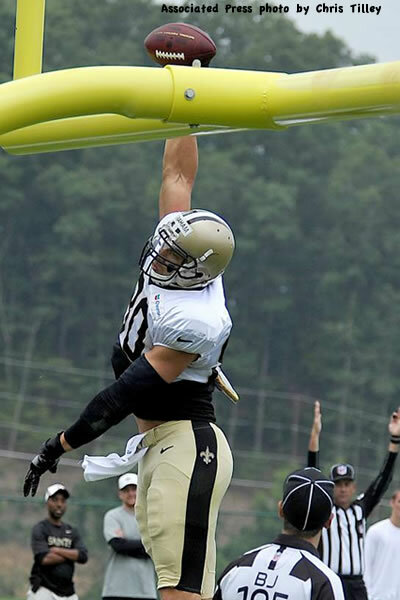 WHITE SULPHUR SPRINGS, W. Va — All-Pro Saints tight end Jimmy Graham won’t be able to get around the NFL’s ban on dunking this upcoming season by finger-rolling or shooting the ball over the field goal’s crossbar. It will all constitute using the ball as a prop illegally and draw a flag for a 15-yard penalty, NFL referee Gene Steratore said Saturday morning during a media briefing at The Greenbrier Resort in West Virginia. Want to be a part of the Who Dat Nation team ? We are looking for a few good Saints fans who have strong opinions. You think this is the year of the Saints will get in on the ground floor. Join us and each week we will have a story you prepare to be posted on our site. THEN…. let’s see what the people think. Send us an email at admin @ whodatnation.com and we will be reviewing them soon… first game is only few weeks away. Posted in Saints News, Who Dat's | Comments Off on Want to be a part of the Who Dat Nation team ?